The Watermark Monitor is a Data-Logger which automatically takes soil moisture readings. This reading history provides you with a vivid picture of the soil moisture profile your irrigation practices have created. This data can be evaluated to determine ways to improve the irrigation scheduling for optimum results. 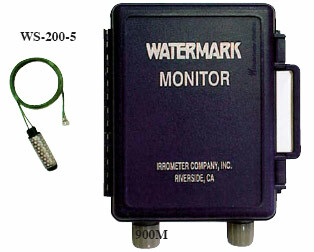 Individual Watermark sensor readings display on the Monitor and can be taken at any time manually. The In–Field display allows you to make on the spot checks, necessary for scheduling purposes while the Monitor is taking periodic readings to record the performance history. Irrometer® switching pressure gauges (optional) can be used as switch position sensors to indicate when the system pressure is on and off to display the irrigation events. Temperature compensation of the soil moisture reading is automatic by using one or more temperature sensors or programming a default value. Reading Frequency from every minute to every day. In–Field display of current reading. Download history to a computer. A unique name for each sensor being read. The date and time you want readings to begin. – Watermark Soil Moisture Sensor. – Temperature Sensor in fahrenheit. – Temperature Sensor in Centigrade. Stored readings are downloaded to a computer for display, as in Fig.1. Other display options are available. The WaterGraph software, included with the Watermark Monitor, is used to set up your individual site profile, launch the data–logger, download recorded history and graphically display the results. The data file created can also be opened by spreadsheet or graphing programs, like Microsoft Excel®.